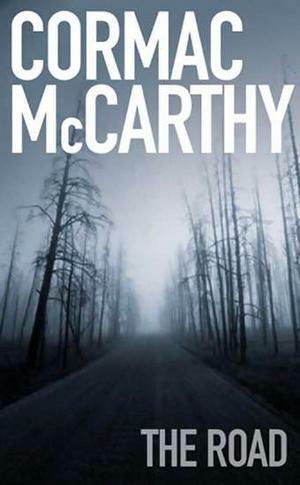 Cormac McCarthy's most recent book tells the beautiful yet chilling story of a nameless protagonist and his son as they struggle to survive in a post apocalyptic wasteland. It was awarded the Pulitzer prize in 2007, been turned into a hit movie and named the book of the decade by the Times, but until it is reviewed by me it lacks that most coveted of accolades, the Debs seal of approval. The Earth is dead, with ashen trees and fire storms sweeping the land, and canned goods serving as the sole source of food on which survivors depend. Most of the population has resorted to murder, cannibalism and a complete loss of the moral fibre that connects our society. The nameless father and son duo serve as a last bastion of civilised existence, straining against a world that does not accommodate their nature. It's the ultimate tale of profound paternal camaraderie, as the novel explores the limits of diligent parenting and an emotionally devastating nihilistic perspective on the value of living. If there's one theme that pervades the text in this book it's pointlessness, with paragraph after paragraph of the protagonists marching endlessly through the wastes, with no specific destination in mind. The inevitability of death hangs over proceedings from the first chapter, whether by disease, starvation or murder, and characters weigh the options of suicide and mercy killings with a sobering clarity and lucidity. Throughout it all, the father questions his ability to hang onto his former humanity, questions his ability to make the tough decisions in a world where every path appears to lead to certain horrific death. It's a literal hell on Earth, with the Earth part of that fading away slowly. Every nostalgic scene of salvaged coca cola, a preserved bunker with showers and cooked food, makes you ache for the artificial world that we accept as standard, while the baser instincts of survival come to the foreground. It all works beautifully due to the style that matches the substance. The simple, nihilistic style of writing and speech evokes the best of Hemingway, and propels the Road beyond the standing of a typical post apocalyptic nightmare. It's engrossing, and the pages turn at lightning speed, I ended up getting through it after two sittings. Only the ending ruins the book. A Deus ex Machina of sorts, it seems entirely at odds with the thematic and contextual style of the rest of the book. There-in lies the problem with a nihilistic outlook, there is no satisfactory ending, the very concept of doing so contradicts the idea of nihilism. One wonders if the tiny ray of hope at the end adds anything to the meaning of the book, or merely undermines its core themes.